Strolling Savannahs garden squares ringed by antebellum mansions; riding a horse-drawn carriage along Charlestons streets of colonial homes; kayaking in tidal marshes teeming with wildlife off Carolinas Outer Banks; conversing with pre-Revolution-clothed residents in historic Williamsburgs inns and taverns  youll experience all this and more on a tour along the southeast Atlantic coast. My wife and I recently returned from the four-site itinerary and so enjoyed it that were asking ourselves why we waited so long to take this Southern Grand Slam tour. Its easy to plan your own itinerary based on the proximity of these sites. 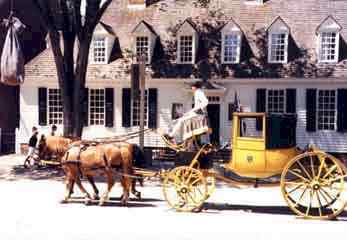 An excellent alternative is to fly in and out of Raleigh, NC, making a circle tour by auto, staying three nights in each area. 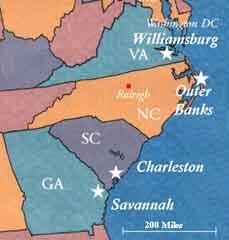 If you have less time to devote, you could shorten your stays or visit only Savannah and Charleston, leaving Williamsburg and the Outer Banks for a future trip (or vice versa). Any way you slice it, youll encounter an incredible amount of history and a variety of activities. Youll most likely want to stay in the midst of the historic districts in small period inns or B&Bs. A good option for getting around is to rent bicycles for leisurely, yet extensive sightseeing. With three nights in each area, you can devote a day to enjoying nearby water sports and nature-viewing options at the seashore and in tidal waterways. As you tour Savannahs historic center youll admire the preservation efforts that have conserved or restored over 800 of the original 1200 homes. Englands General James Oglethorpe started the port town in 1733 along the banks of the Savannah River. Today youll find a bustling waterfront area of shops and restaurants on cobbled River Street. The towns residential area extends back from the river with homes dating from the 1700s and 1800s on a combination of narrow and broad streets connecting the towns 21 garden squares. Savannah's squares are the essence of its fame, filled with Spanish moss-draped oaks, colorful flower beds, and inviting benches such as that featured in the film, Forrest Gump. Be sure to visit a couple of the many historical homes that serve as museums of Savannahs history. 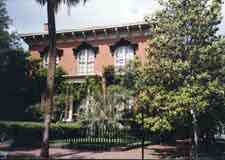 Two favorites are the Owens-Thomas house and the Telfair Mansion, which also serves as Savannahs Museum of Art. Just off of Madison Square youll find the house owned by musician Johnny Mercer (not open to the public) that was the site for the book and film, Midnight in the Garden of Good and Evil. Be sure to experience Savannahs great cuisine at restaurants such as Olde Pink House, Seventeen-Ninety, or the Pirate House with jazz pianist Emma Kelly, playing upstairs at Hannahs East. We spent a day boating and kayaking along Savannahs many neighboring islands and were rewarded with sightings of pelicans, egrets, ospreys, herons, and playful bottle-nosed dolphins. 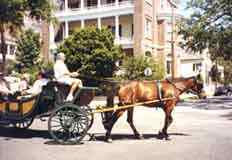 The best way to start immersing yourself in Charlestons wonderful spirit is via an hour-long horse-drawn carriage tour. Youll receive an interesting and lively historic overview as you enjoy the visual images and aromas wafting from the jasmine, wisteria and sidewalk cafes. After this, youre ready to continue your explorations on foot or via bicycle. Charleston is situated perfectly at the tip of the peninsula formed by the Cooper and Ashley Rivers in South Carolinas Low Country. The city's original English settlers arrived in 1681 after abandoning their struggling Charles Landing settlement, started in 1670. Charleston's signature architecture resulted from the town plan of narrow lots on narrow streets. Most homes are only one room in width, with side porch entries behind façade street doors. Wealthier residents opted for two lots and double-width homes. Youll also find a street of plantation-like mansions across from beautiful White Point Park where the rivers join the sea. When it comes time to dine and relax, be sure to sample Charlestons signature dish of she-crab soup at one of its many fine restaurants. Youll also enjoy the night scene at the bars and music clubs near Old City Market where street vendors sell a large variety of crafts. Be sure to leave time to explore the nearby sites of Charles Landing and Magnolia Plantation, as well as the great beachcombing and kayaking opportunities at Kiawah or Seabrook Island. The long stretch of narrow outer islands that shelter North Carolinas shore provides a perfect vacation from your vacation. On one side of the banks is the Atlantic, while on the other side lie sheltered sounds and marshes. 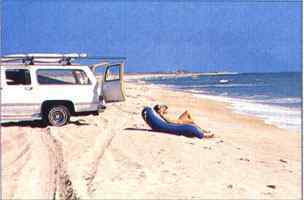 The auto roadway ends at Corolla, NC, leaving a long, sparsely populated stretch of the bank leading into Virginia. Here you can take 4-wheel drive vehicles along the beach to surf, windsurf, or explore for wildlife, including the scattered wild horses that have roamed here for centuries. We took our "vacation from our vacation" at Sanderling Resort, a beautiful spot just north of the village of Duck, NC. The resort has access to both the sea and the sound on a narrow section of the bank less than ¼-mile in width. The resort offered bicycle and kayaking rentals, 4-wheel tours (yes, we were able to find wild horses), a private beach, and excellent lodging and dining. The possibilities for lodging and exploration seem limitless along the 150-mile length of the banks, from Ocracoke, north past Cape Hatteras, to Corolla. Historical exploration opportunities include the Cape Hatteras Light House, Kitty Hawk, and the Fort Raleigh National Historic Site, where the Sir Walter Raleighs Lost Colony disappeared in 1585. You wont find a U.S. locale more steeped in history than Virginias 30-mile long Colonial Parkway route, which includes Williamsburg, Jamestown Settlement, and Yorktown. 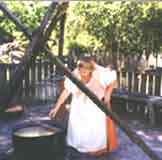 Jamestown Settlement is a living museum, with people playing the roles of early settlers and Indians. 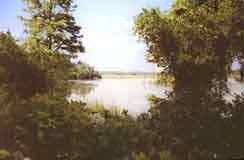 It includes a re-creation of the original James Fort constructed by America's first permanent English colonists in 1607. 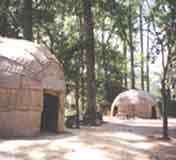 The Powhatan Indian Village outside the fort represents the culture of the 32 tribes that inhabited Virginia when the colonists arrived. 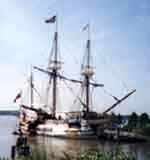 Docked near the fort are reproductions of the three ships that carried the colonists to Virginia. These replicas were built in the 1990s and have actually sailed the original 6,000-mile trade winds route through the Caribbean to Jamestown. Williamsburg is the most enthralling living museum weve ever experienced. 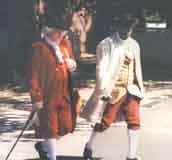 The town was founded in 1699, succeeding Jamestown as colonial Virginias capital. All of the homes, inns, taverns, and workshops that you find today are restored or are replica s of the original structures. Each commercial establishment is staffed with people clothed in the garb of pre-Revolutionary Williamsburg, speaking the language of the times. We had the good fortune to share lunch at one of the taverns with a local resident playing the role of an actor from the original Williamsburg Theatre. To round out your historical touring, be sure to visit Yorktown, site of the final battle of the Revolutionary War, where Washington defeated Cornwallis. Here youll see the original 1691 town, the harbor, and the nearby battlefields. Youll be amazed at the expanse of the battle area, where 17,000 troops under Washington surrounded and defeated Cornwallis force of 5,000. 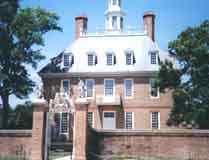 If you have an extra day to explore, be sure to visit one of the nearby James River plantations dating from the early 1700s (30 minute drive from Williamsburg), and Thomas Jeffersons famous Monticello (two-hour drive). 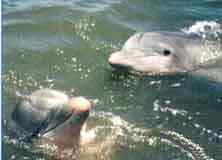 Click here for details to plan your own trip to the Southeast Atlantic Coast.